When A Country Defaults, Who Comes Knocking? We all know what happens when individuals stop paying their bills. It's an onslaught of angry letters, pestering phone calls and bankruptcy paperwork. But what about when an entire country can't pay the bills? Argentina's default in 2001 is a nightmare scenario for lenders warily looking at Europe's crisis. 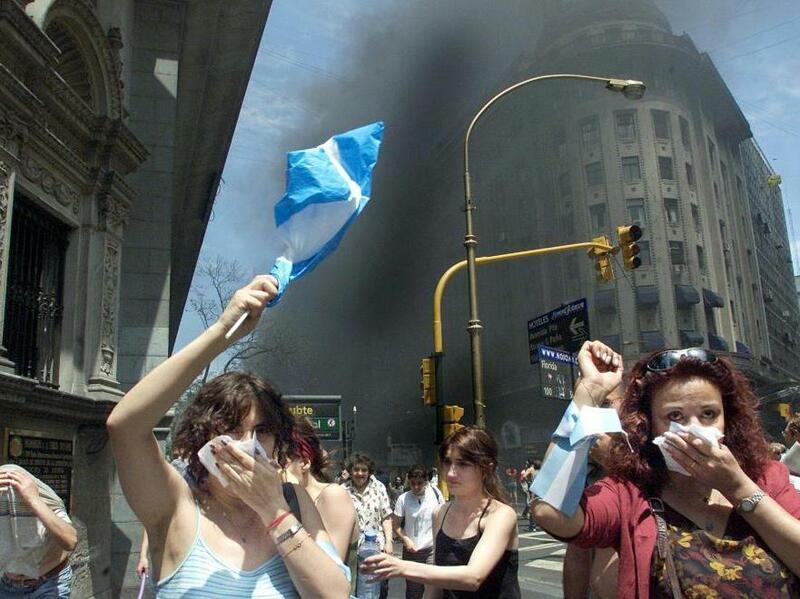 Protesters in Argentina in 2001 wave national flags as they walk through tear gas and smoke from burning street fires set by demonstrators during the country's financial crisis. We all know what happens when individuals stop paying their bills: angry letters, pestering phone calls and possibly getting property repossessed. In the end, you might declare bankruptcy and start again. That's how it works for a person up to his eyeballs in debt, but how does it work for an entire country? Harvard economist Ken Rogoff says that it's not unusual for countries to go into default. In fact, he says it's happened hundreds of times. "A lot of countries have gone bankrupt and they don't even know it; it's not even in their history books," Rogoff told weekends on All Things Considered host Robert Smith. "Most countries have gone bankrupt at least a couple of times." The reason lenders continue to do business with a country is that, unlike businesses or individuals, a country can't go out of business and continues to pay at least something to its creditors, Rogoff says. He says there are many ways a country deals with a sovereign default, but most often its finance minister simply declares it does not have the money to pay back lenders. "There isn't unfortunately a pretty way to do it. It is a big event when a country defaults on it foreign lenders," Rogoff says. "That said there are times when there's just not a better direction to turn." But what happens when a country chooses not to pay its debt and essentially tells its creditors to get lost? That's what Argentina did in 2001, when the country was in massive debt, there were no jobs and rioters had taken to the streets. What happened there is the nightmare scenario for lenders around the world. Argentina's troubles began long before defaulting, as Paul Blustein recounts in his book, And the Money Kept Rolling In (and Out): Wall Street, the IMF, and the Bankrupting of Argentina. It had tied its currency to the U.S., declaring that 1 peso equaled 1 U.S. dollar. But as the U.S. economy grew, there was no way Argentina could keep up, Blusteinsays. Policymakers couldn't devalue the peso, print more money or even increase government spending for fear investors would think they were running up excessive debt. "They were just completely paralyzed from being able to do anything," Blustein says. President Adolfo Rodríguez Saá eventually declared a suspension of payment of the country's debt, and said they would instead focus on "the state's internal obligation with its own people." After that declaration, no one would lend to Argentina; once it untied its currency from the U.S. dollar, because many were fleeing the banking system, the peso collapsed. 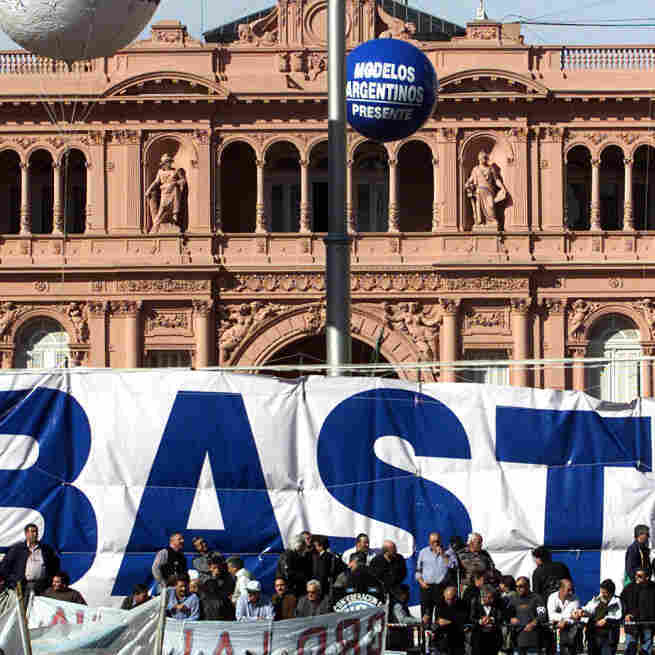 Labor union leaders take part in a protest with a giant banner reading "Basta" ("Enough") before the presidential palace in Buenos Aires in 2001. At the time, the country was mired in a three-year recession and facing default on its $128 billion public debt. "If you're an Argentine worker and you're earning money in pesos but have to pay back your mortgage in (U.S.) dollars, you're facing a rather difficult situation," Blustein says. The country crashed, the rioting got worse, and the banks closed to prevent capital flight. People who had hundreds of thousands of dollars in the nation's banks suddenly found they had nothing. What happened in Argentina is part of the fear about what is happening in Europe today; that if Greece or another country defaults, there will be riots in the streets and runs on the banks. But there is another side to the nightmare in Argentina. How do creditors get their money back? "The fundamental problem is that there is no international law for bankruptcy," says Robert Shapiro, formerly of the Clinton administration. But now, as co-chair of America Task Force Argentina, he represents all those who lost money lending to the country. And, he says, they aren't going away. The issue is that Argentina didn't totally walk away form its debt. A few years later, it offered to pay back about a third of what it owed. Half the creditors agreed; the other half refused. Argentina still owes around $16 billion with interest, quite the motivation for the lenders. "They hired lawyers and they went to court," Shapiro says. Argentina has lost about 104 cases, Shapiro says, but the problem is it still refuses to pay. "It's very hard to get a sovereign country to pay," he says. But nations in default have to be careful because any new money they raise could be seized, Shapiro says. Lenders may also try to go after airplanes that are owned by the national airlines, or try to detain warships that dock in a foreign port. And, Shapiro says, it goes without saying that no one will lend you money for a long time. "You cannot escape the basic rules of international capital markets," he says. "Over time, there's isn't any doubt the price Argentina has paid is much greater than any benefit." Although it has been difficult in Argentina, many people think the default was the best thing to happen. After the banks opened up and the peso was devalued, Argentine products suddenly seemed cheap on the world market. Soybeans and wheat exports rose. The money started to pour back into Argentina. Blustein says, in the end, the default wasn't the problem. It was the sudden and catastrophic way Argentina did it. That's the lesson for a world on the brink of another spectacular collapse. "What the international community needs to recognize about these cases is that, if the country really can't pay it back it's much better to do it an orderly way [with] creditors," Blustein says. "In the long run it will be better for the country than if they had tried to struggle on and pay debts that were too great a burden for the economy to bear."